In a topping cycle, utilization of fuel burnt is mainly for the productions of electricity and excess thermal energy is recovered. Heat energy is generated as a byproduct of the cycle, which is used to attain the thermal requirements or satisfy process heat. 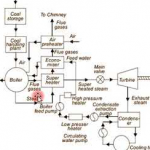 Basically, fuel and air are burnt in a combustion chamber and combustions gases thus produced. 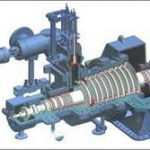 Mechanical or electrical power is generated by an associated rotary engine or gas turbine. In this system, high pressure, as well as low-pressure steam, is produced. 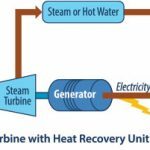 Any type of fuel is burnt and a high-pressure steam is produced which is then passed on a steam turbine to produce electric power. This water absorbs additional heat from an engine. It is run through a heat recovery boiler which can either transformed to process steam or hot water. This system from the turbine is passed through a heat recovery boiler. This exhaust energy is converted to usable heat/steam.